Benefitting Right Action for Women, the foundation established by award-winning actress and breast cancer survivor Christina Applegate, LG Electronics USA and charitybuzz.com are auctioning off unique Hollywood memorabilia from last month’s “20 Magic Minutes: A Family Celebration” event in Beverly Hills. Hosted by Applegate and sponsored by LG to celebrate the launch of the new LG Mega-Capacity TurboWash Washer, the June 23 afternoon event was filled with fun, family-focused activities such as spin art, pizza-and cupcake-making, manicures and more. Each activity took less than 20 minutes; the same amount of time the LG TurboWash Washer saves families per load of laundry. 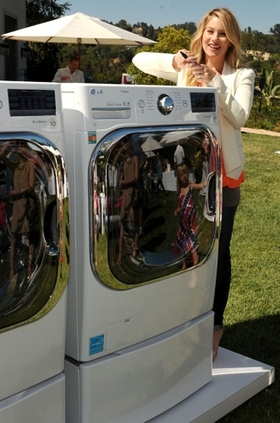 Hollywood moms and dads in attendance – including Jillian Michaels, Elisabeth Rohm, Joely Fisher, Melissa Rycroft, Marisol Nichols and David Alan Basche, among others – were invited to autograph LG TurboWash washing machines, which are being auctioned to benefit Right Action for Women, founded by Applegate in partnership with the Entertainment Industry Foundation. Right Action for Women provides screening to individuals determined to be at increased risk of breast cancer. The auction will run until July 12 on charitybuzz.com. To place bids, consumers can here and here. The new LG washer features the largest capacity in the industry, so it can wash more clothes – including larger, bulky items in fewer loads – saving time and money in energy use. In fact, there is enough space to effectively clean a king-size comforter and full set of king bedding in a single load. Additionally, it incorporates LG’s innovative TurboWash technology that allows users to save 20 minutes per load, even with larger loads of laundry, while still offering outstanding cleaning performance. The LG Mega-Capacity TurboWash Washer received the 2012 ENERGY STAR Most Efficient designation which recognizes the most efficient products among those that qualify for the ENERGY STAR. The new washing machines are available in the U.S. market at a manufacturer’s suggested retail price of $1,399 (White) and $1,499 (Graphite Steel).